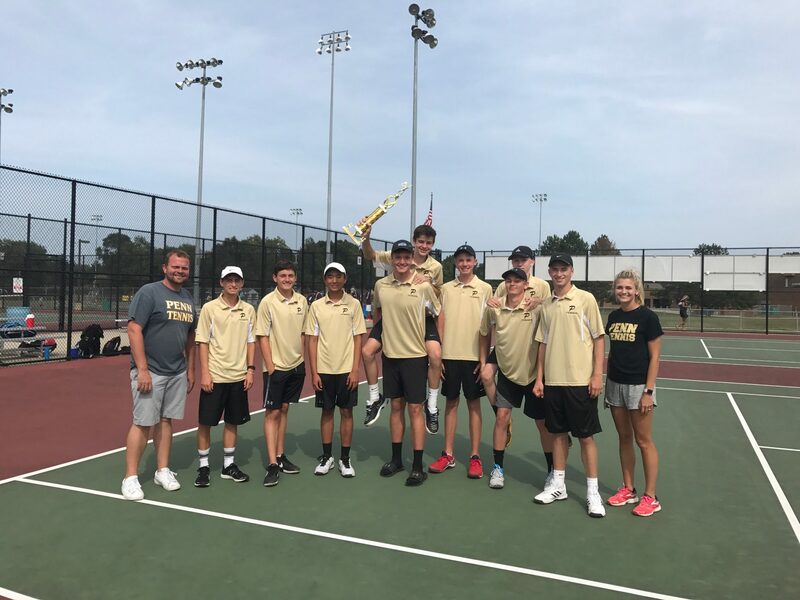 Penn Tennis held an invitational with Marion Chesterton and Northridge. Penn won with the record of 3-0, Marion followed with a record of 2-1, Northridge owned a record of 1-2, and Chesterton was last with a record of 0-3. Matt Jewison defeated A.J. Antonelli (P), 6-3, 4-6 (10-7). Will Thurnin (P) defeated Chad Whelan, 6-2, 6-4. Aidan Sucharetza (P) defeated Nick Hanson, 6-1, 6-1. Eric Spaargaren-Aiden O’Day (P) defeated Luke Liapes-Paul Petro, 6-2, 4-6 (10-1). Maity Spitters-Nick Casetti (P) won 6-0, 6-2. Riley World defeated A.J. Antonelli (P), 6-1, 6-0. Noah Lyons defeated Will Thurin (P), 1-6, 6-1 (10-12). Aidan Sucharetza (P) defeated Vikram Oddiraju, 6-4, 6-3. Eric Spaargaren-Aidan O’Day (P) beat Jack Fauser-Johnathon Waltz, 6-7, 6-2 (10-7). Maity Spitters-Nick Casetti defeated Ethan Eltzroth-Caleb Spitzer, 6-2, 6-3. Simon Grevengoed defeated A.J. Antonelli (P), 7-5, 6-2. Will Thurin (P) defeated Gabe Rodino, 6-0, 6-2. Aidan Sucharetza (P) defeated Cooper Tavernier, 6-1, 6-1. Eric Spaargaren-Aiden O’Day (P) defeated Logan Corns-Eric Firstenberger, 6-2, 6-3. Maity Spitters-Nick Casetti (P) defeated Avery Mantyla-Conner Glenn, 6-0, 6-0.